while browsing through the blogosphere yesterday, i came across this sweet lil b&b in holland called bed of flowers via decor8 - i'm absolutely smitten with the bright, vibrant colours. they're the perfect thing to feature on this lovely post-easter tuesday. there's gotta be some sort of great-vacation-guarantee while staying in a place like this - how could you not feel compelled to get out and enjoy the weather (cause it's gotta be always sunny there, with walls that colour) or even stay inside and read a great book? 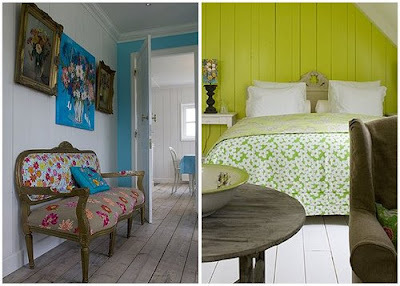 i'd love paint my walls this vibrant but i'm not quite sure if i have the guts to commit to it. bright and cheery is right! love these. I'd decorate everything like this. Very nice. 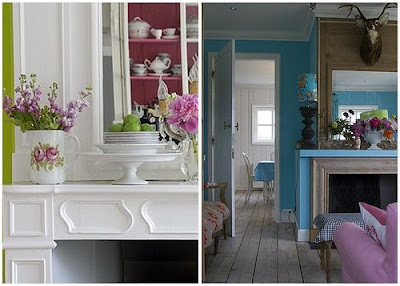 LOVE these images - perfect balance of whites and brights! These pictures made me SO HAPPY as soon as I saw them (: No joke, I felt giddy. I would love to stay in this B&B! I'm not sure I would have the gutz to paint my own house these colors, but they sure are amazingly adorable! I'm not quite bold enough to paint my home bright colors either. I bet I'd love it though if I worked up the nerve! Commit! I went bright and I'll never go back. Also, painting a wall is less of a commitment than you might think. You can always paint over it. i think they look great, you just need to be certain you love the colour before you commit! I love it...love love love it! 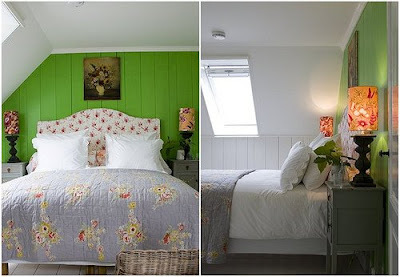 Pairing the pop of bright...the green bedroom wall particularly caught my eye...with dove-grey and white floors and other walls, keeping most of the other accessories in the room smaller and in complementary colors...well, it just plain works! Those photos are such eye candy! My perspective is to bring in bold color through accessories---pillows, lamps, duvet covers, vases, etc. That way if you get sick of it, it's so easy to change up! great colors! 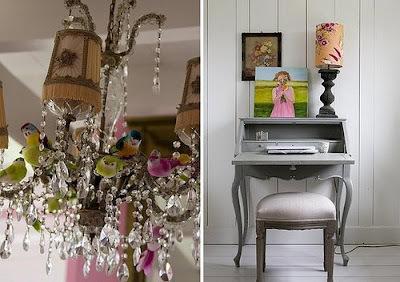 i love the little birdies in the chandelier... so cute! Oh, what fantastic rooms. Love those green walls! Oh O love these colors!!! I love how not every wall is painted, so that it isn't too overwhelming. I would love a house painted with these colors. 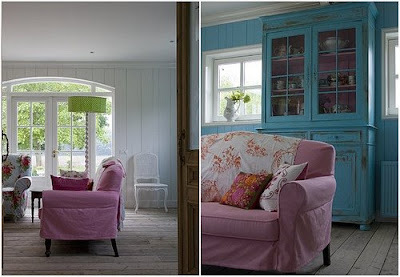 i love these bright and cheery rooms. you can always paint one wall just to see.